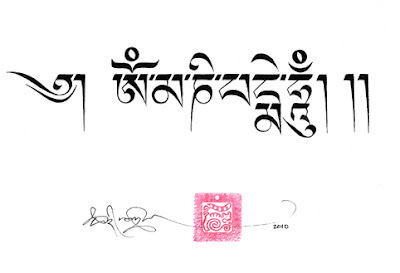 The neo-Mongolian/Tibetan Phags-pa script was devised as a uniformed style by the Tibetan Lama ‘Blo-gros rGyal-mtshan’, during the regime of the Great Kublai Khan 1260-1294. 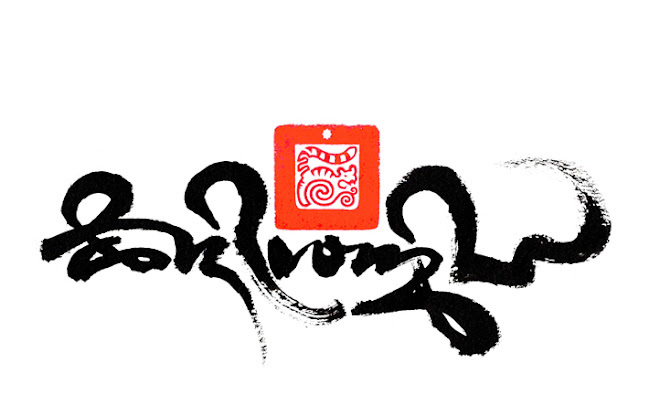 Phags-pa was also known as the new Mongolian script called Horyig in Tibetan. This was imperially imposed as a national script of the Mongol empire of the Yuan dynasty 1271-1368 encompassing all of China. 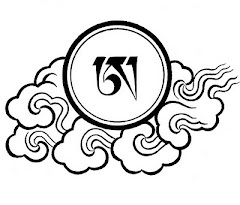 This particular Phags-pa script style used by Tashi to represent the famous Mani mantra of compassion, originates in 1348. This was discovered scribed on stone tablets at Juyonguan in China, located at the nearest section of the Great Wall to Beijing. Only fragments of this beautiful form of Phags-pa style survives today, great effort and research were made to resurrect the Mani mantra to a correct representation in this rare script style, much due to the guidance of Andrew West, who is an expert in ancient scripts of the Far East. The Phags-pa script bears some resemblance to Tibetan but differs distinctly in that it is written vertically downwards in columns running from left to right, much like Mongolian. Units are often formed of several characters that are separated by spaces. From top to bottom the Phags-pa script reads om ma ni pad me hum. Dru-tsa is one of the several U-med script styles, which is traditionally used for more ornamental calligraphy. The cursive form of the characters lends its self well to a more free style calligraphy that can be skillfully expressed in longer elegant tails and vowel signs. As we cultivate “pure perception” with great joy, all veils are cleared. One should practice “pure perception” in the way explained above. The blue ‘Utpala’ lotus represents transformation from relative to ultimate; on the open lotus is a white moon disc, which represents stainless purity. Emanating vertically from the seat of the lotus is the Mani mantra. The background of green to blue swirls suggest the water on the pond of Saṃsāra, the ocean of suffering for which compassion and understand is engendered. 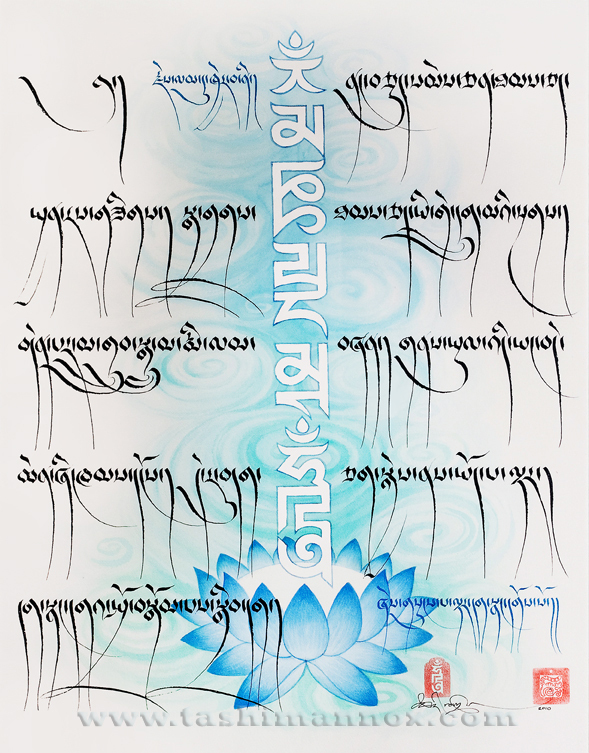 The Mani mantra in 'high' Uchen script style, © Tashi Mannox 2010. This year the Contemporary Calligraphy Museum hosts The III International Exhibition of Calligraphy 2010 in the historical Russian town of Velikly Novgorod. 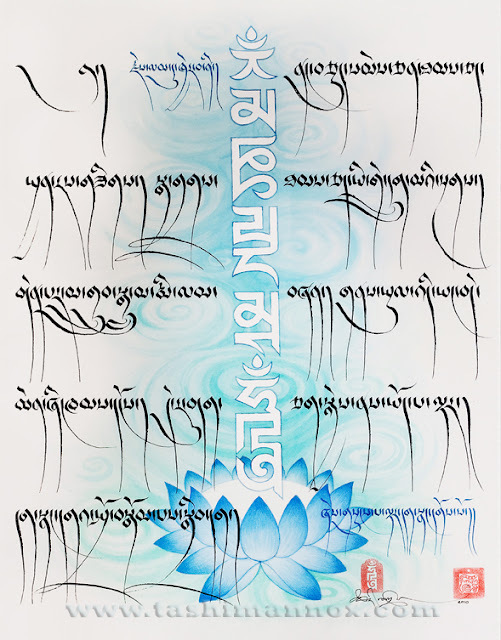 The main theme of the exhibition is 'Sacred Calligraphy', which the above piece called 'Sacred Mantra', was create by Tashi and donated to the Contemporary Calligraphy Museum especially for this particular calligraphy collection. The exhibition extravaganza features art pieces of world class calligraphy artists from 43 countries, opens and runs September 10th -12th 2010. "(Spontaneously) Sacred Calligraphy". The most precious of Tibetan calligraphy is said to be embossed in gold on tablets of Lapis-lazuli stone, of which this art piece emulates. © Tashi Mannox 2010. A demonstration explaining the correct proportions of the Uchen script style. More is written on this subject found here.